Facing elimination for the first time in the series, the Bruins needed their best game of the series. After Morgan Rielly opened the scoring 9:42 into the first period, the Bruins didn’t let the early deficit faze them, instead finding their game and carrying the majority of the play for the remainder of the contest. It was Marchand’s power play goal shortly after Rielly’s strike that sparked the Bruins, and turned the game in their favor for good, as the Bruins followed up with goals by Torey Krug on the power play and Jake DeBrusk, his first of the series. After a dominating second period, the Bruins survived a third period push by the Maple Leafs. Once Auston Matthews’ fifth goal in four games cut the Bruins lead to one, things got dicey in the Bruins end as Toronto turned up the heat. But Tuukka Rask and the Bruins managed to push through, sealing the deal with Marchand’s empty net goal. 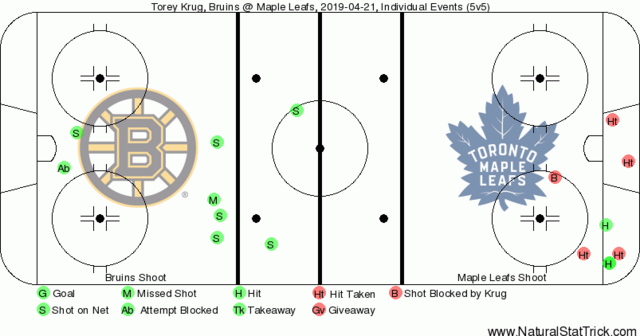 As Krug mentioned, the Bruins D were very active, especially Krug himself who finished with a team-high nine shots on goal, and a team-high 12 shot attempts. The Bruins d-core as a whole finished with 18 shots. Special teams was huge for the Bruins in Game 6, a game that once again featured a handful of questionable calls for and against both teams. I think the officiating as a whole in the series has been awful. The Bruins converted on both of their power play opportunities, while the Maple Leafs went scoreless on their three tries. After Sunday’s two-goal performance, the Bruins have scored seven power play goals in 16 chances. One thing Toronto has done a great job of in the series has been the ability to take away the middle of the ice in their own zone. So to not only see DeBrusk finally put a puck in the net, but to do so by getting to the net, was nice to see. After an ugly performance from the bottom-six in Game 5, the Bruins third and fourth lines were much better in Game 6. Even though the line of Marcus Johansson, Charlie Coyle and Karson Kuhlman were on ice for both Toronto goals, the bottom-six was generating chances and dictating puck possession. In 6:55 of five-on-five ice time, the Coyle line held the advantage in shot attempts 12-3 and scoring chances 3-1. Now, with Game 6 in the books, it’s time to turn to Game 7, the second Game 7 between the two teams in as many years. The beauty of Game 7 is nothing else matters. Not last year, not 2013, not even games one through six. Surprised that these two teams are heading to Game 7? You shouldn’t be. “I’m not surprised at all to be honest, that was actually my guess at the start,” added DeBrusk who will be playing in his second career Game 7. Mine too, Jake. Mine too. Game 7 is what the Bruins and Maple Leafs do.